Enter these commands to create the database and table. Enter these commands to populate the table. (You can copy the whole block then press Enter). Five of the many possible date string formats for June 25th 2004 from the documentation are '25.6.2004', '06/25/2004', '6-25-04', '20040625' and 'June 25, 2004'. We now provide details of a Lazarus form-based demonstration that enables the user to view and edit records in the Election table created above. We added to the form a button, a DBNavigator and DBCalendar from the Data Controls tab, a Datasource from the Data Access tab and a SQLQuery, SQLScript, SQLTransaction and IBConnection from the SQLdb tab. 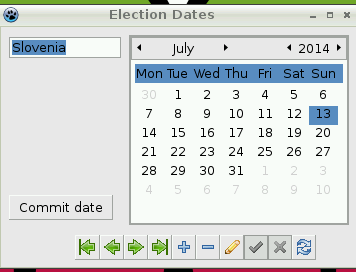 (We tried first without a SQLScript and button and found that changes made to the date using the DBCalendar were not retained on returning to the record). The SQLite equivalent with a DBDateEdit on a PC with a more recent version of Lazarus was much more straightforward.